This is the location of the new nestbox on the North Grand Island Bridge installed this February by the Thruway Authority. The Peregrines, however, seem not to be using it, which likely means they are nesting dangerously on the bridgework. Monday I did see one Pefa flying over the bridge and it flew under the bridgework near this box. flying around and mating, but this construction project is just bad timing for these birds. Last year the nesting pair was discovered when one of the eyases fell into the river. The male had been taken by his rescuer to the nearby shore and left there but eventually was taken to the SPCA. taken to rehab and released elsewhere later. It has been speculated that perhaps the older female siblings pushed him off the small nest. This is the Canadian side of the Niagara Gorge where Pefas have nested in the past, but this year the hole they previously used is still empty. Not a good sign. We plan to go to the Canadian side soon and scan the American side of the gorge, though Friday through Sunday is forecast as rainy here. 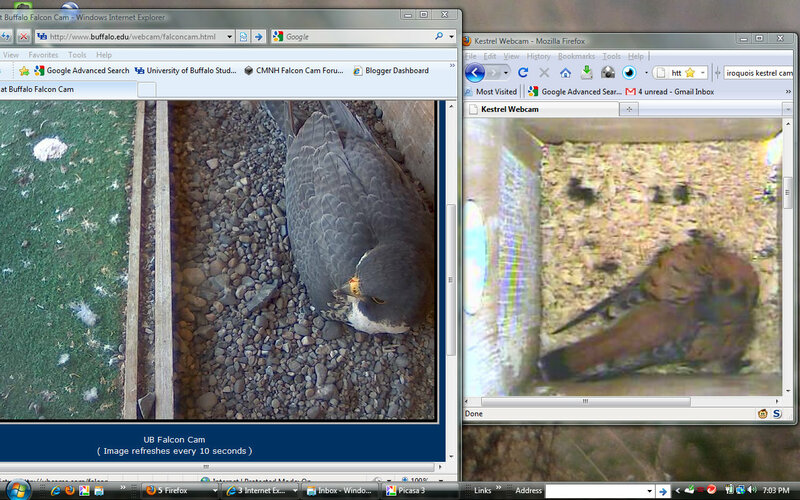 This is what is on my desktop lately - the UB Nestcam and the Kestrel cam from the Iroquois NWR. The kestrels now have five eggs! while the Statler birds are incubating at least four eggs. We have nothing new to report on the Grain Elevator pair. Are they incubating somewhere in that large structure, or have they continued on to another area? Central Terminal will be checked soon to see if there are any eggs yet.